Rob	Smith	joins	Native	as	Digital Analyst	Website data analysis and insight. Joel	Rayden	joins	FreshBuzz Media – Social Media Strategy and Design Agency	as	Managing Partner, Vice President of Digital Strategy	Leadership of strategic initiatives including business development, digital strategy, research, analytics and key partnerships. Judith	Cohen	joins	FreshBuzz Media – Social Media Strategy and Design Agency	as	Founder and CEO	Leadership of internal and external strategic initiatives including client strategy, management, development and key partnerships. Carla	Bourque	joins	Buddy Media as	Senior Vice President, Western Region Sales	Carla will head up the opening of Buddy Media’s new San Francisco office, and will lead the company’s sales initiatives for the U.S. West Coast. Ken	Mandel	joins	Buddy Media	as	Managing Director, Asia	Ken will oversee and manage the opening of Buddy Media’s first Asian headquarters in Singapore. Wayne	Kurtzman	joins	Pitney Bowes	as	Manager, Social Media Marketing Research	Help direct the growth of social media strategy and analytics..
Norys	Trevino joins	Logitech	as	Senior Manager, Social Media Create & implement the social media strategy, coordinating with stakeholders across Logitech to ensure its effectiveness and encouraging adoption of relevant social media techniques into the corporate culture and into all of the company’s products and services. In addition to working on a metrics framework in which to track it’s effectiveness. Alex	Schott joins	Entergy	as	Manager, Social Media & Multimedia Communications	Develop effective, ongoing social media strategies across all channels of social media. Ed	Van Siclen	joins	Lithium Technologies as	SVP of Business Development & Global Alliances	Van Siclen will drive the ongoing expansion of Lithium’s worldwide partner network, identifying, managing and maximizing the company’s alliances and growth opportunities. Emily Erekuff	is promoted at	Trulia	as	Community Programs Manager	Emily is responsible for managing our Voices platform and expanding Trulia’s online community. Randy	Skinner	joins	Telligent	as	Chief Operating Officer,	Randy Skinner joins Telligent as Chief Operating Officer and will focus on ensuring customer success worldwide as he oversees departments for customer care, delivery, professional services and education. What would you tell 600 marketers from the largest global brands who have European initiatives? That’s exactly what I was tasked to do here at Bazaarvoice’s Social Commerce Summit in London today. These brands, which are quickly moving into the space, have adopted social technologies that include: ratings, customer discussions, and aggregate that data right on their own corporate website. While companies are quick to launch a social networking page for their brand, or integrate customer discussions onto product pages, our research has found there are two distinct classes of companies: 1) Those that are building programs that will not scale, forcing them to ever-respond to customers and fall behind internal stakeholder requests. On the other hand, 2) Those that develop scalable programs that involve business formation, enabling the crowd to do the work for you, and under pinning systems that will cascade across the enterprise are better suited to avoid a career in sanitation. Update: A video of they keynote is now available. Left: Occupy SF on Sat, Oct 6th. A small group in early am manages camp in front of Federal building, crowd ebbs and flows throughout day. Photo via Ken Yeung. 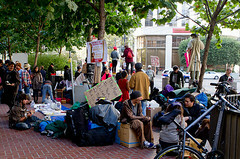 Three days ago on Saturday, I visited the Occupy SF location with Chris Heuer of Deloitte, Chris Saad, VP of Strategy Officer at social media startup Echo, local photographer and technologist Ken Yeung (see his photo set, which made the Huffington Post), Startup CEO Larry Chiang, Altimeter Researcher Zak Kirchner, and my business partner Charlene Li (and her son). Our mission? To interview the occupiers to understand their POV, in the context of understanding what they want, and where this movement is going to head. Every day, I run searches on Twitter and Google news to follow the story, watch videos, read blogs, and mainstream news. Yet it wasn’t enough, to really understand, and in the spirit of research, I needed to go down and see for myself and interview occupiers. The Occupy SF camp was not fully ramped when I saw it, perhaps this is what NYC looked like over a month ago. Who was there? Some would call them angry youth, homeless, old hippies, but I call them core catalysts. While they don’t look like the mainstream, you can easily see how they are able to get more involved, esp as they tap into the unions for the march last Thursday. We found some of them excessively angry, shouting demands that are unlikely to ever happen, and when I probed most, and asked “What is the solution?” they often did not know. However I did talk at length with a middle aged cab driver who was educated, and well travelled. He explained that they didn’t know the answer, but were here to point out the problem. We respectfully continued the conversation for many minutes, and shook hands while he momentarily rested his picket sign. Overall, I noticed there were many mixed messages, most were there for different reasons, including homeless folks who just learned about it and decided to join in. I even witnessed a debate between two members arguing over what should be in a picket sign as it was focused on one group’s agenda. A very mixed bag for sure. What was really interesting to see is how they were organized anarchy. The group has “general assembly” where they get together as a group and issue ideas and orders. They also have a food donation line, where supporters bring food for them to eat at any time. There was also a stationary bicycle being used to power car batteries (pic via Zak), which in turn powered cell phones, laptops. Ironically, although they were protesting in front of the Federal building, they were using wifi from some open network right in that building, here’s me in the middle of the camp. They also had a schedule of events, including workshops in which they would self-teach each other. Follow Altimeter analyst Rebecca Lieb who has been watching the Occupy Wall Street movement from Manhattan. The NY model is the one to watch, as this continues to grow by the thousands, other cities may follow suit. We’ve already seen that unions (NYT reports) are joining the march and just yesterday, Unilver owned Ben & Jerry’s announced their support for the Occupy Movement and cited their stance on corporate social responsibility. I’ve been talking with Alan Webber, who has a series of steps for companies to manage disruption, which I’ve included below. We even talked to the cops (pic) who had their own opinions, (and often gave it to us) but were there to protect both the Federal property and the freedom of speech, a delicate balance. 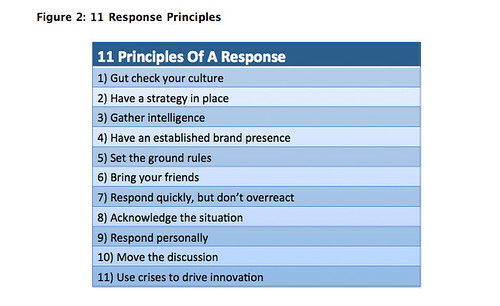 We just completed an extensive study focusing on 50 social media crises examples to understand what companies did, and what they needed to diminish the crises. While this case is far larger than any Facebook punking, we also have evaluated how GM and Ford responded online during the recall, they both created website to take the conversation head on. While both sites now redirect to their corporate website, years later, you can still find their GM Reinvention videos, repositioning as a rebirth. Altimeter analysts have been exchanging our views from our different cities and are continuing to discuss what this means for culture and business. Read more on Alan’s blog on how companies should respond to disruption. I’ll be enacting the “Living room” policy for comments, I’m open to all conversations in the comments, as long as they would be the same as I would allow in my own house from guests, let’s discuss. Update: Altimeter’s Rebecca Lieb gives her perspective from NYC. I’ve been watching with great intrigue the growing groundswell of the Occupy Everything that is directly challenging the economy, business, and the market. My business partner Charlene Li and I and the rest of the Altimeter analysts have been watching and discussing this growing movement, and want to learn more. We conduct research (like this report on crises) for many of the large corporations that the movement is directing their energy at, and want to better understand this as this movement at this time is offering an ongoing dialog through their protests. To learn more, Altimeter’s Charlene Li and myself (and other colleagues) will head to the movement to meet the protesters to engage in dialog and learn more from them their goals Sat morning in SF at 10am. We invite other business leaders (we’re business owners too) to join us, to engage in dialog and learn. If you can’t attend (or too bashful to do so) please use me as a conduit, what questions would you want me to ask the protesters? Leave a comment here on this blog, or join the discussion on my Google+ feed. 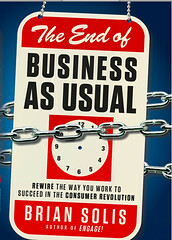 I hope to engage in a civil conversation and learn more, as we continue to watch how business continues to evolve. Update: Colleague Alan Webber has posted about managing to disruption, in the context of Occupy Wall Street. The LA Times features how employers are hiring social media professionals, showcasing a sliver of how folks spend their time during the workday. Scott Gulbransen joins H&R Block as Director of Social Media, hailing from Applebees social media program, read his blog, as he provides insight on the role. Jon	Barilone	joins	Digital Media & Learning Research Hub	as	Community Manager, where he leverages social media to initiate and maintain dialogue about the Digital Media & Learning Research Hub and its mission. Mike	Beauchamp	joins	The Golf Warehouse	as	Corporate Social Strategist	Direct and manage all social initiatives for the company’s four brands. Erica	Kei	founds	Kei Consulting	as	Founder	Social media media marketing consultant based in San Francisco. Brycie	Jones	is promoted at	Oregon Health & Science University	as	Social Media Manager	Managing the social media strategy for the institution and its academic, healthcare and research missions. Jeffrey	Mack	joins	Crestron as	Social Media Marketing Manager	Expand Crestron’s social footprint through increased engagement in established networks and entrance into new social channels. Tony	Lorenz	founds bXb Online as	Founder	Launched new company to help organizations to extend their face-to-face events with virtual and social media technologies. Maura	Ginty	is promoted at	Autodesk	as	Senior Manager, Strategic Research & Innovation	Integrating search, social, and other new digital programs. Daniel	Zucker	joins	Autodesk	as	Social Media Manager	Lead social media strategy, analytics, training and cross-company work. Xavier	Jimenez	joins	Lithium Technologies	as	Director, Product Management	Focusing on product strategy alignment with social media innovation, customer analytics, and enterprise customer success at Lithium. Derek	Sawchuk	joins	Passenger as	Senior Community Strategist	Business Development in Canada and Midwest, US. Jason	Butka	joins	Passenger as	Senior Community Strategist	Develop new clients by building proper strategy, expectations and structure for research, innovation and advocacy based online communities. John	Schneider	joins	Taykey	as	SVP of Sales Heading up sales at Taykey, a Sequoia Capital backed start-up. Sachin Devand	joins	33Across	as	Vice President of Platform Products	He is currently responsible for developing next generation advertising products for 33Across. Carine Roman	joins	33Across	as	Vice President of Operations	Her responsibilities encompass analytics, media and sales operations, campaign optimization, and fulfillment. Pedro Mejia	joins	33Across	as	Vice President of Finance	In his broad capacity as VP of Finance, Pedro oversees multiple facets of the organization, such as finance, facilities, and HR, while also providing commercial and strategic partnership to the executive team. Last but not least, Rebecca Lieb joins Altimeter Group (where I’m an analyst) as our analyst focused on media, advertising, content.